Okay... I've washed off some of the river mud, and taken a few more overall pics of the bike with the rack in position. In sunlight the rack doesn't seem quite so overpoweringly red. I'll be adding the Luxor front rack with lights (shown in the fifth photo) sometime soon. 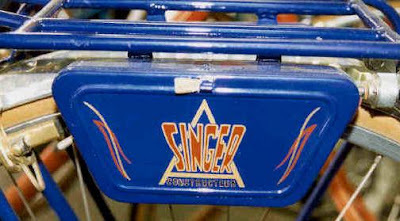 At the bottom is a picture of the tool boxes on Jim Cunningham's Alex Singer for comparison to the Peugeot boxes. It is too much red. And a bike of that stature deserves a discreetly topnotch bag, not any old red nylon. It would match so nicely with the green tweed Nigel Smythes from Rivendell. Also- those twin headlights are going to haunt me for a long time with their haunting elegance. It is a FINE bicycle. Okay. Is this Kipper Snack red? The Rev is nuts. The bag is good. The Nigels are fake name and too precious. 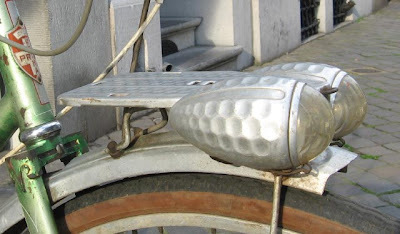 I like the idea of a red rear flap with the Betty Page profile chrome chick on it. Be brave old boy, be brave. I'm with the Rev on this one. Well, I am nuts- but polite company requires you not mention it. Yes, they are "fake name", but not too precious for this build at all, at all. I got a great eye and it tells me that's too much red. Nothing wrong with a bare naked lady on there though. I see you found the blue tool boxes that Cunningham had. His bike was a pretty old Alex Singer - had the old school stem that clamped on - kind of like an Aheadset.